Presentation of the work involved in the elaboration of the CD with the Mojoca: Movimiento de jovenes de la Calle (Movement of the Youth of the streets) in Guatemala City. inhabit the streets are not based on the social norms we know, for they live at the margin of our society. It is true that they have a lot to learn, after suffering so much violence, they learn to react with violence, however, it is of great beauty to find between them a deep respect towards friendship and an unmatched ability to live the moment. I have no doubt we need also to learn from them, especially related to the changes we so much desire. who help each other. We met in Sardinia, at a conference about extreme poverty. He asked me to come to Guatemala and spread a little music in the Movement. 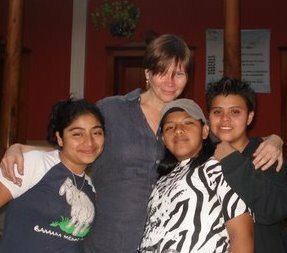 For several years now I have worked integrating music into the work of organizations working to improve our society, singing at conferences, benefit concerts and so on – but what emerged from the visit to Guatemala and working with the Mojoca was something new. Getting to know these kids and singing with the young people of the street awakened a desire to write music that could represent somehow what they live, what they feel and give them a voice to express themselves. This album of songs is the concrete result. To be able to come to Guatemala for the first time and start off the project, I organized – together with some associations – a few concerts in Europe. The concerts were free and in each one I explained the idea of the work to be done, and asked for a donation. It was exclusively through these donations that the basic expenses for founding the choir were paid. It also allowed us to hire Salvador Ovalle, a Guatemalan musician, flexible and dedicated, to continue the work going twice a week to sing with the kids. Meanwhile, in Switzerland Michelangelo Rinaldi, an Italian pianist and oboist, felt inspired and moved by the desire to be part of the project and has continued to organize concerts for raising funds to ensure the continuation of this Project. In the concerts, that take place in Basel, everyone donates something they can afford: the musicians play for free, the hall is also offered free of charge and the people who attend give a contribution to our musical project. All people are all informed about the work we are doing in the Mojoca with young people who have ended up on the streets and wish to change their lives. their parents, or have no relation to them anymore. It is a hard issue to deal with. Their reaction towards this song was very moving. In our first performance most of them cried, because it speaks of their painful reality. When I arrived this time in Guatemala and came to the House of the Mojoca, a boy I had never seen before but who had been told that I wrote the song for them, came up to me and sang it full of emotion and said to me; “That is my song!” Most of the songs are from the point of view of the street inhabitants, they talk about the difficulties but also the beauty and freedom that they get to know. specific atmosphere, is an outlet for grief or joy, or becomes the thread that unites people who feel the need for change toward a more humane and just World. * "We're all on the Road" is a CD with a collection of songs that talk mainly about human trafficking, this production will be released in Italy in the spring of 2012.